Just a quick blog post to start my weekend. 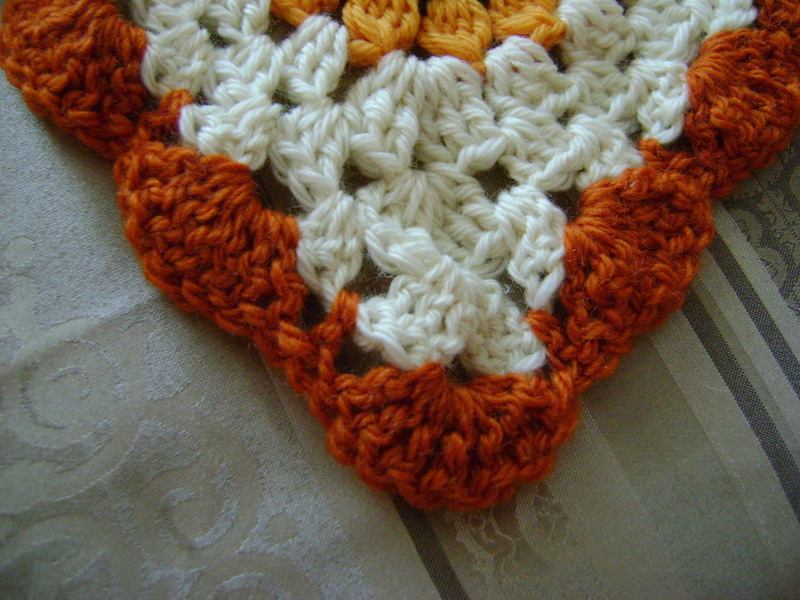 You won’t get much easier than this cowl pattern. 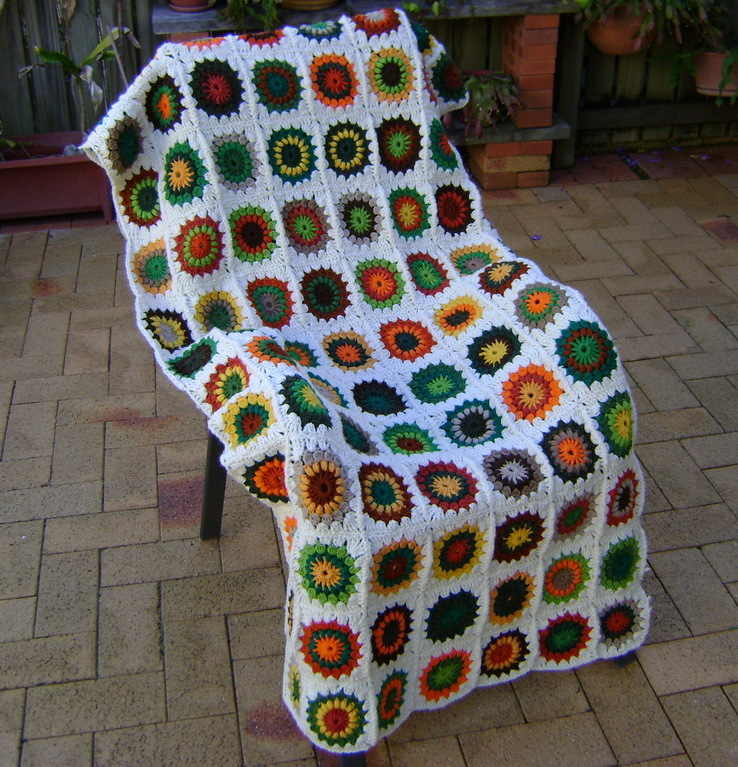 It was in the latest Spotlight knitting pattern book which I received free of charge recently through the mail. It’s knitted using Moda Vera Bouvardia yarn from Spotlight.which is a 10ply / worsted yarn that comes in some lovely colours. 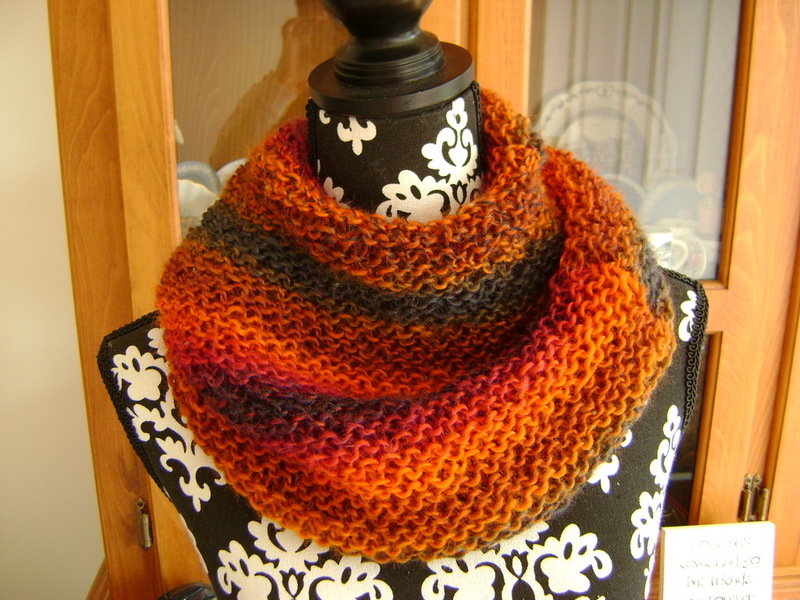 This particular colourway is called Vesuvius hence I have called it my Vesuvius Cowl. As I mentioned, it is very easy to create. 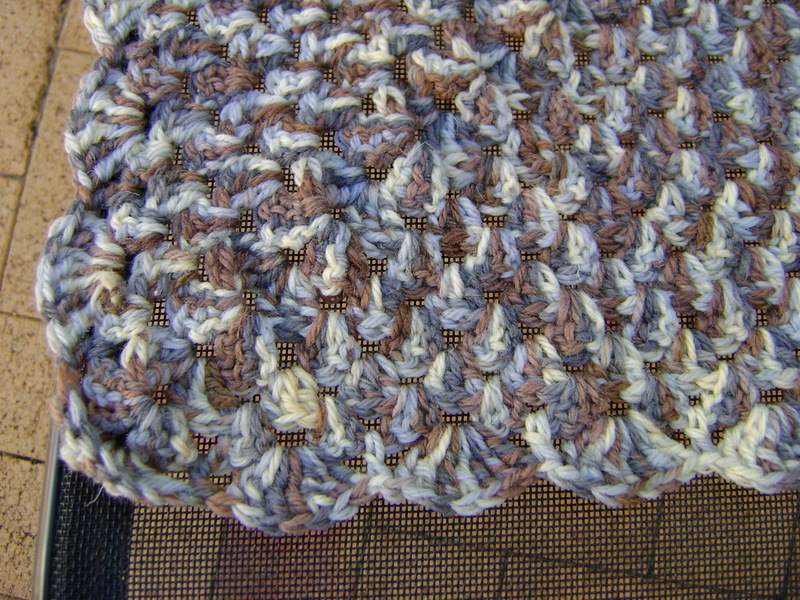 Simply cast on 66 stitches on size 9mm needles. I used circulars as I find them easier to handle. 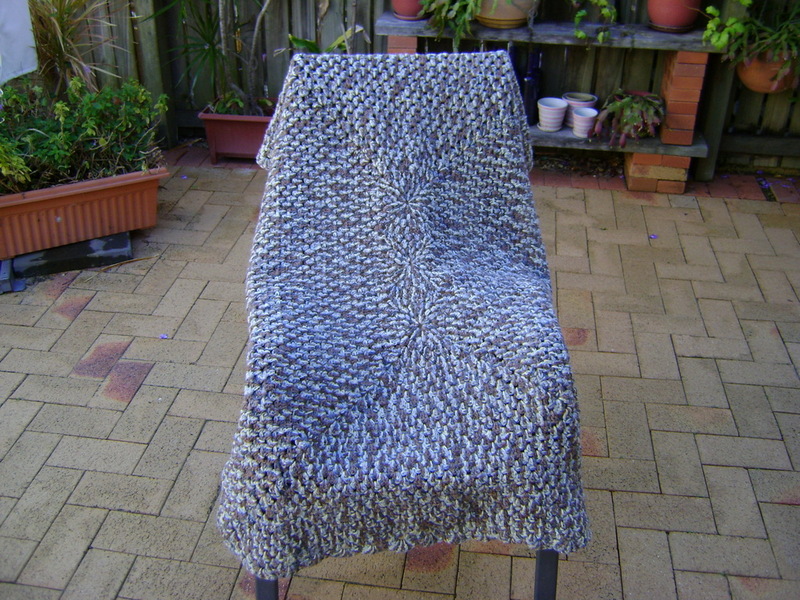 Knit in garter stitch back and forth until the ball of yarn is nearly finished….leaving enough to cast off and sew up the ends. 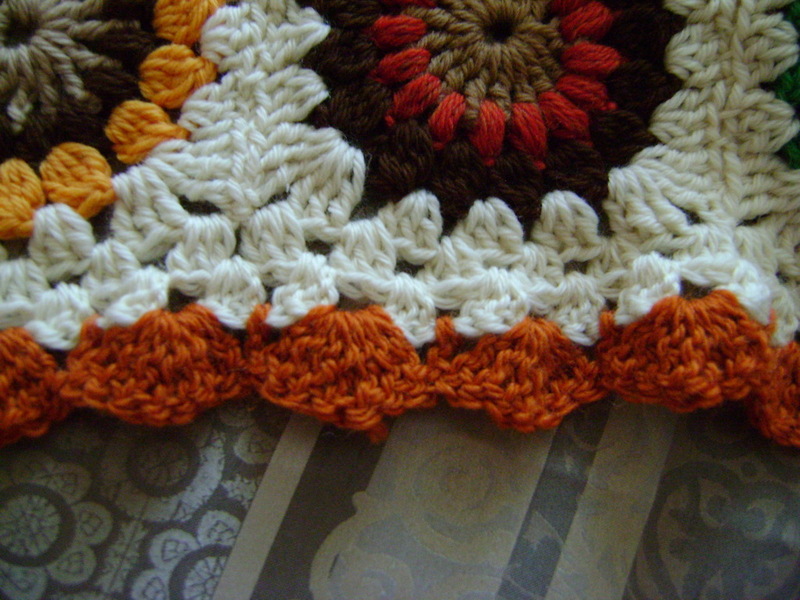 Hold the ends together and twist them before sewing together. This gives a bit of a moebius effect. Voila it’s finished. 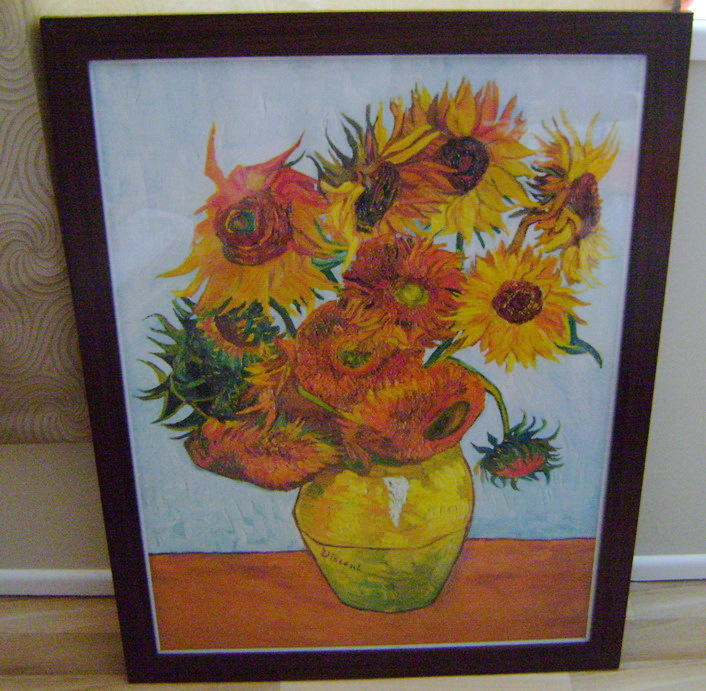 I had it made in a day. 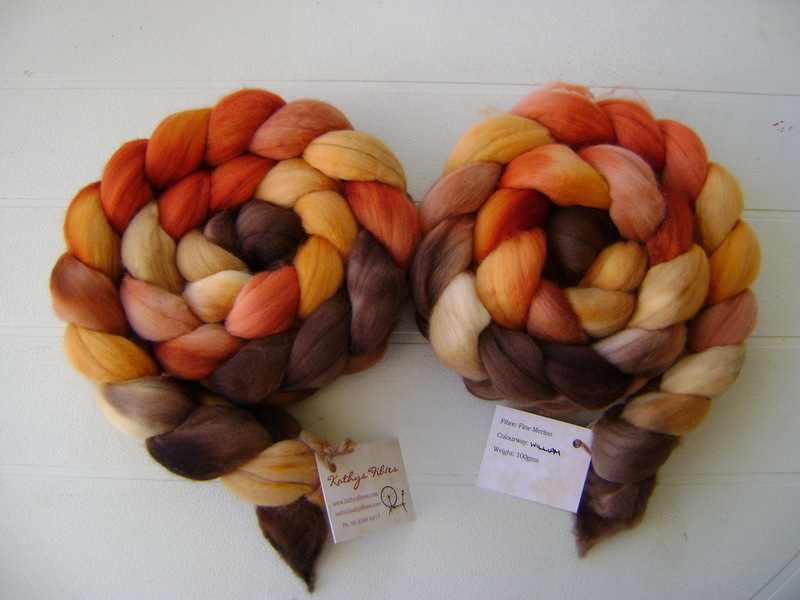 As the colourway name Vesuvius suggests, it does have those lava colours of different shades of orange. I love the effect that cables give to a knitted garment. 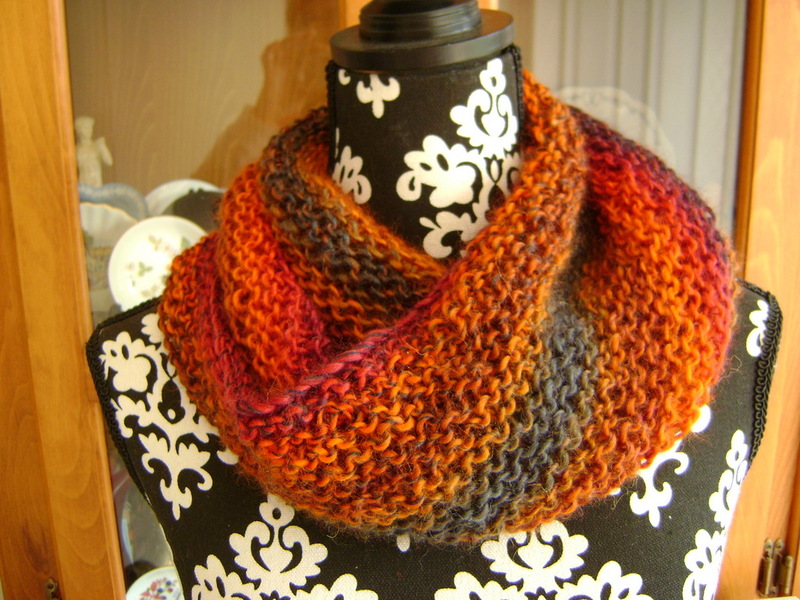 To those who don’t knit, cables look so complicated and intricate and some are however basic cables are quite easy. 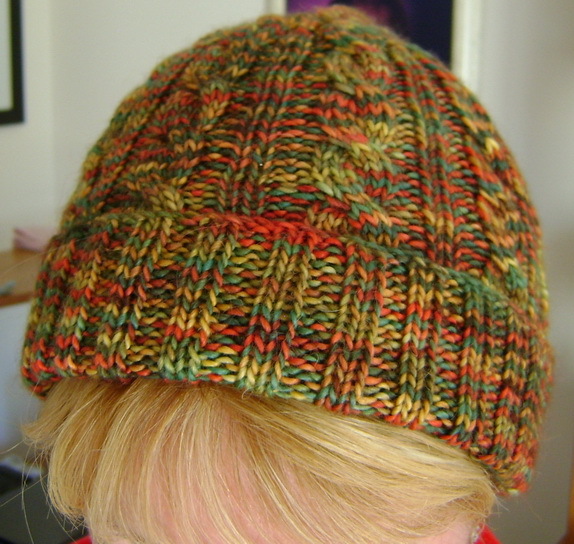 That is why I elected to knit this 3AM Cable Hat from a free Ravelry knitting pattern. 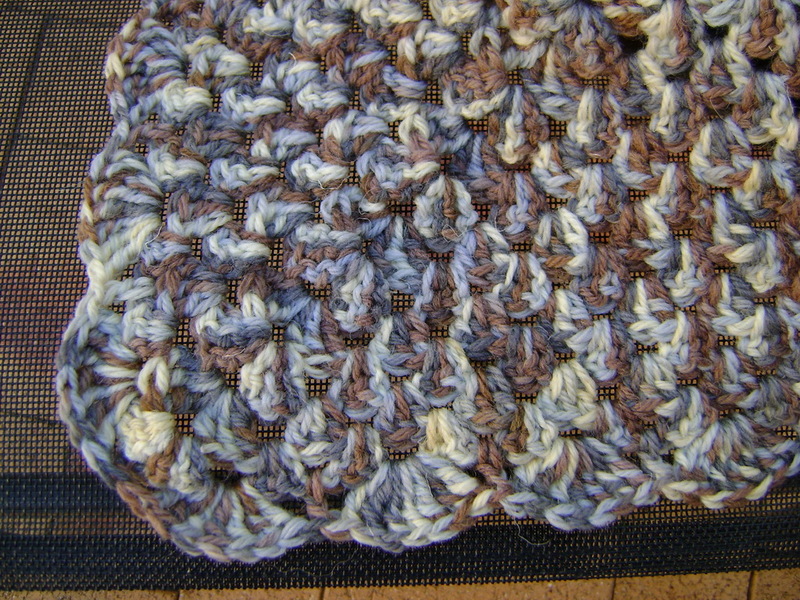 The pattern is knitted as a ladies small so I just added another 12 stitches as recommended to increase the size and also completed another round of the 8 row repeat pattern. This probably made it a medium size. Next time I’ll add another 12 stitches as I have rather a large noggin! This should make a perfect large size. I don’t like my hats to be too close fitting….I prefer a loose fit. 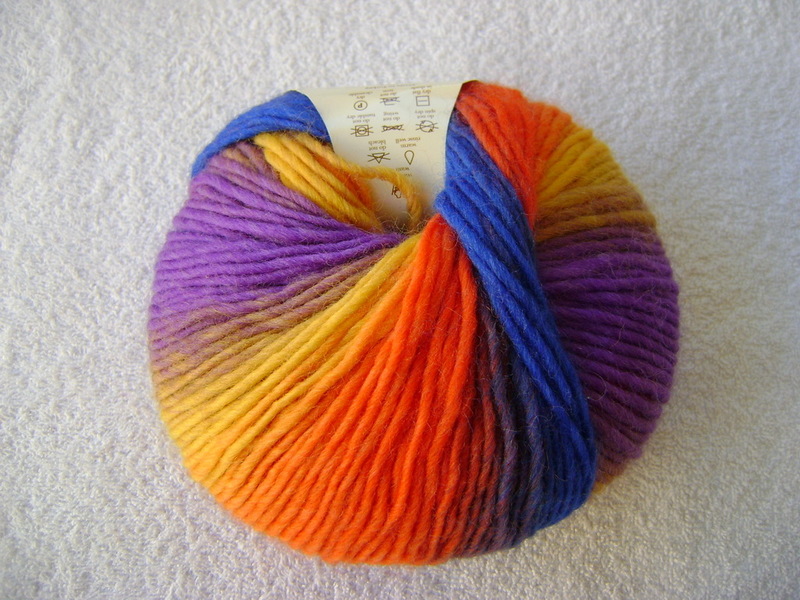 The yarn I used is absolutely beautiful to knit with. 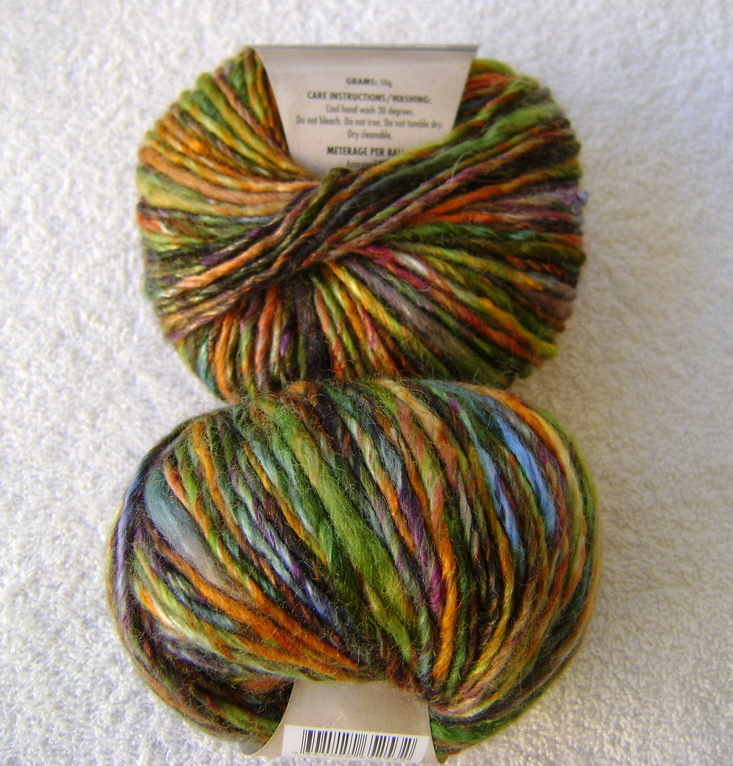 It’s Shorn Fibers Single DK which is a 40% Baby Alpaca 40% Merino 20% Silk yarn blend. 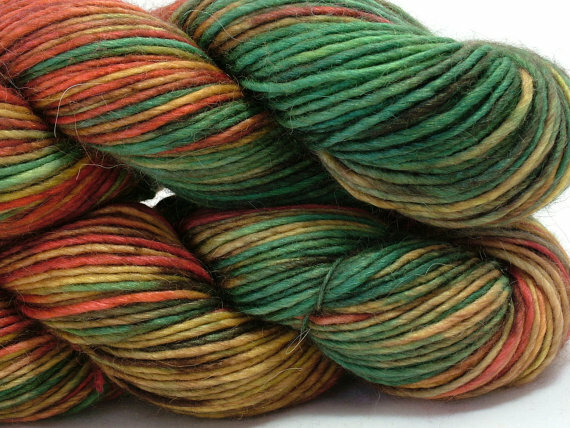 The colourway way is called Autumn Leaves and it’s gorgeous. I used exactly 75g for this hat so with the remaining 25g and the other 100g skein I have I will probably knit a matching scarf. The alpaca in this yarn makes it so incredibly soft and smooshy. This hat will be coming with me when I go on holidays to Noosa in a few weeks time. 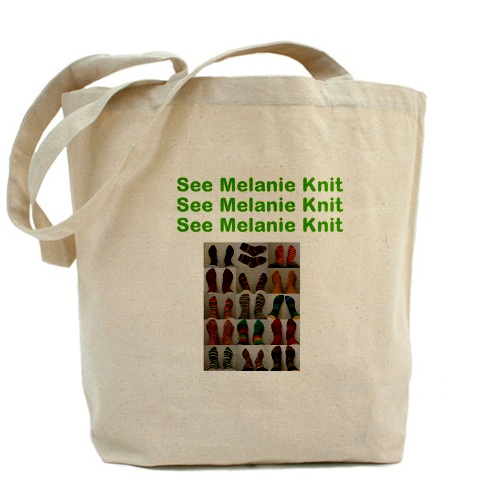 It’ll come in very handy when I walk along the waterfront each morning….well that’s my intention at this stage! 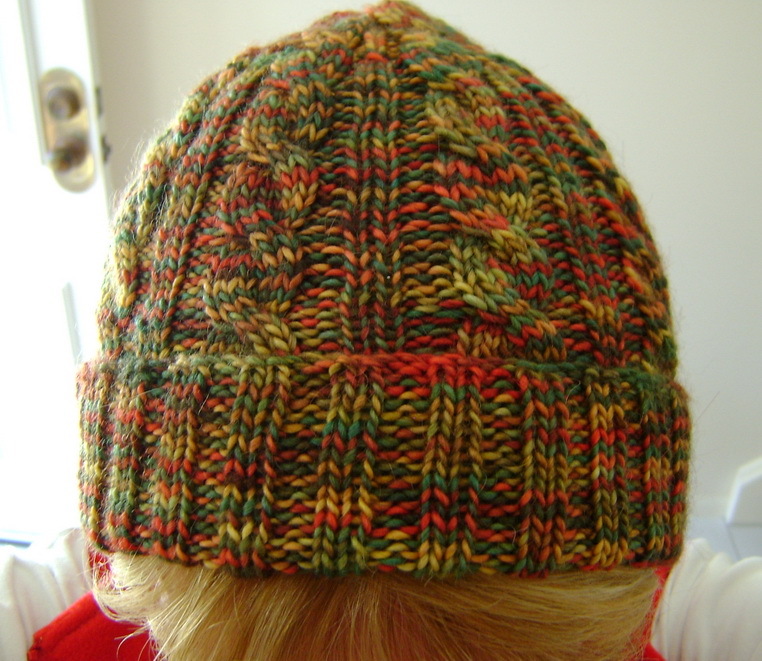 Hats are so easy to knit and don’t take much time so they’re always a satisfying project. 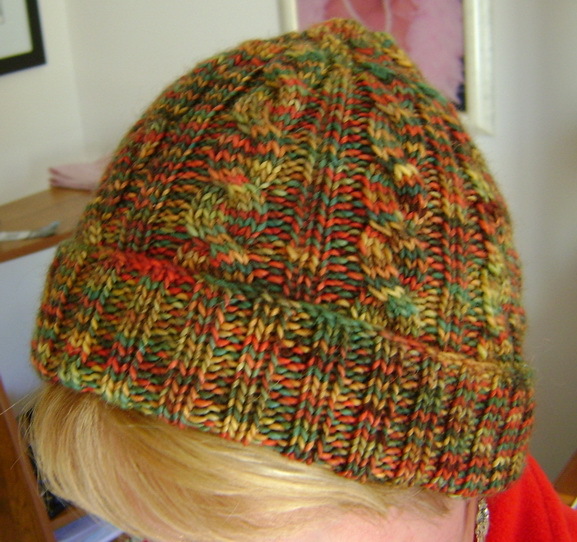 This is my second hat to date, the first one being my Market Day Hat which I blogged about earlier this month. 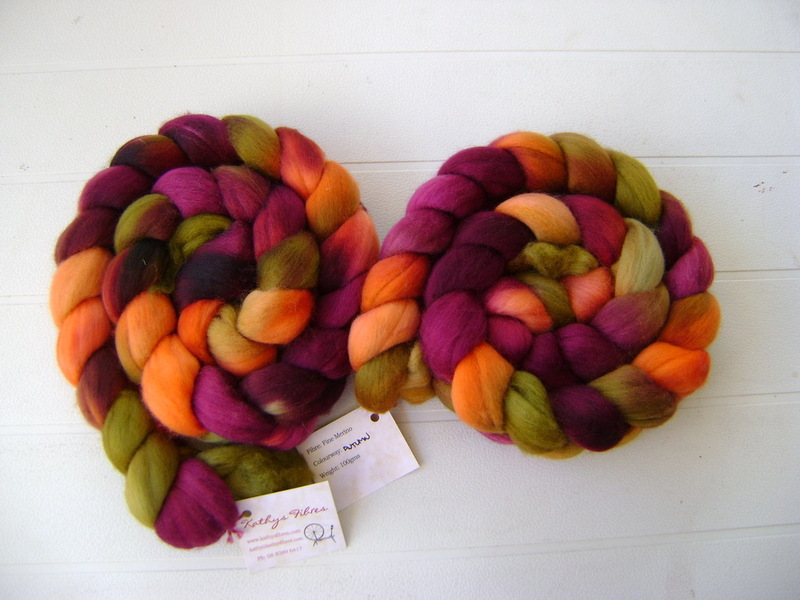 Just thought I’d give you a quick peek at the rovings I bought from Kathy’s Fibres recently. 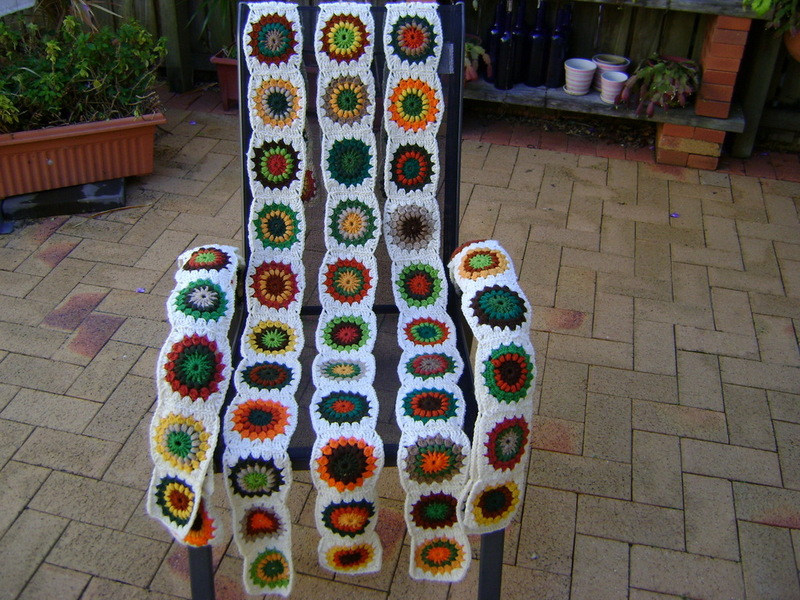 Kathy is located in South Australia and has an amazing website full of gorgeous yarnie bits and pieces.I am hoping that my spinning consistency improves quickly so I can use these rovings. 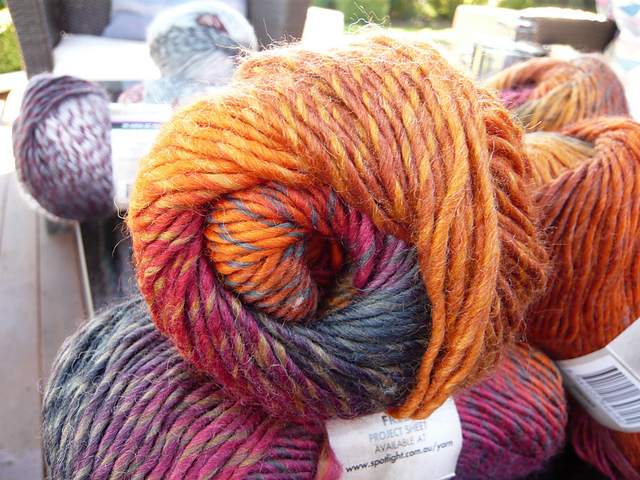 I want to make sure I spin some lovely wool with these gorgeous rovings. I bought two of each and each one weighs 100g. 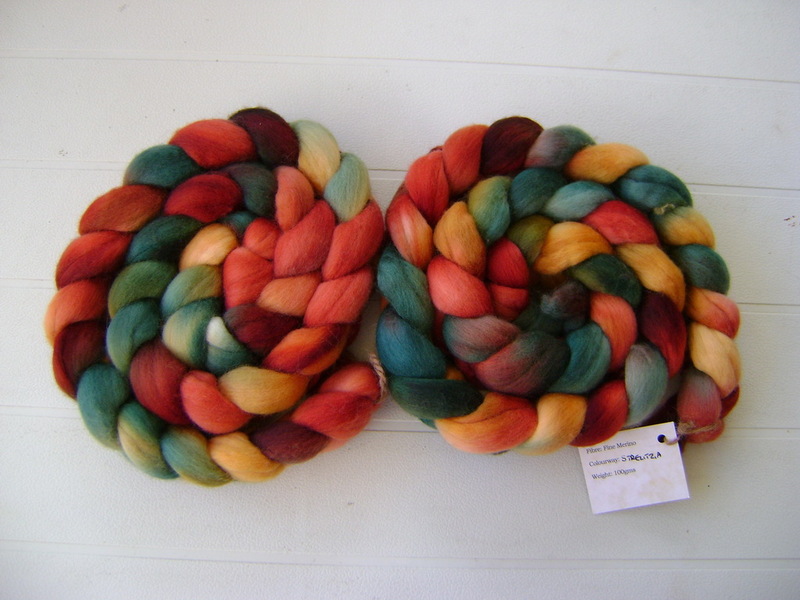 Autumn….Handpainted merino 21.5mic roving in autumn shades of rust, deep maroon and muted green. 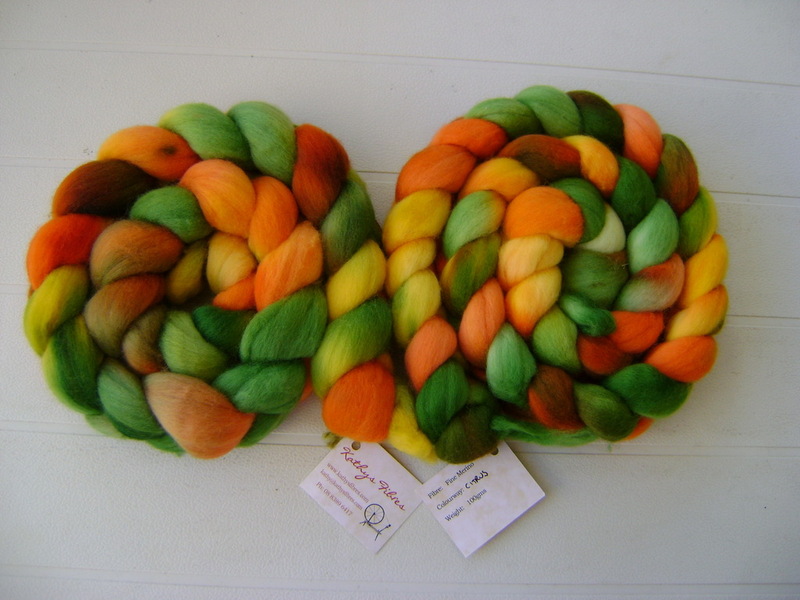 Citrus….Handpainted merino 21.5mic roving in the colours of oranges, lemons and limes. 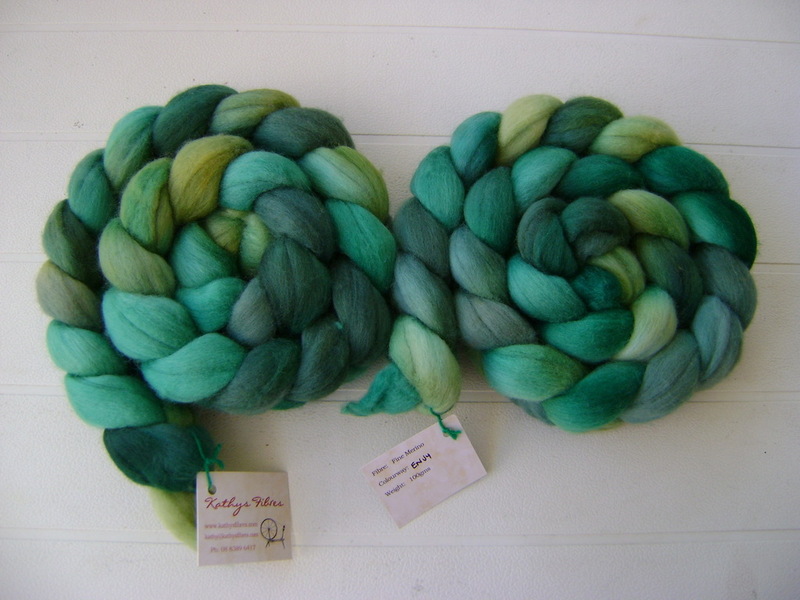 Envy…what other colours would you handpaint a roving called Envy but green, lovely shades of green. Outback…Handpainted merino 21.5mic roving in shades of the Aussie outback. 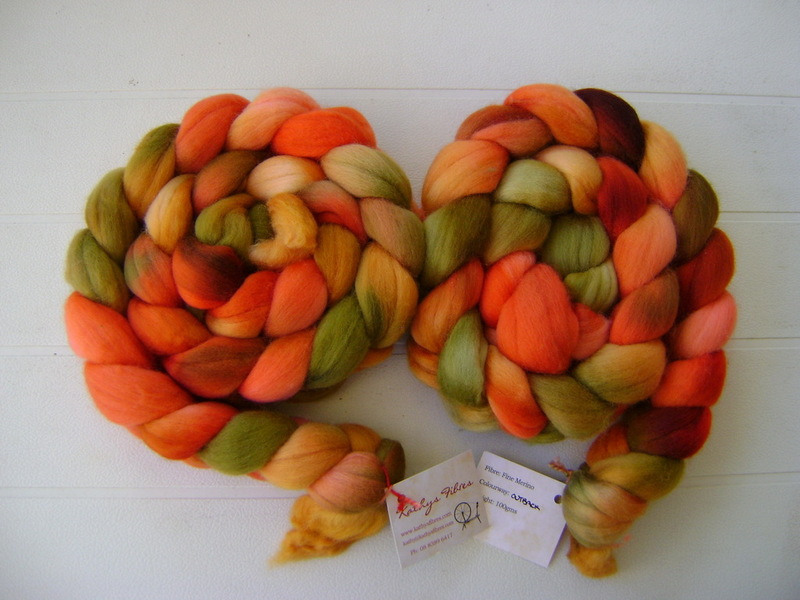 Strelitzia…Handpainted merino 21.5mic roving in lovely greens pinks and browns. 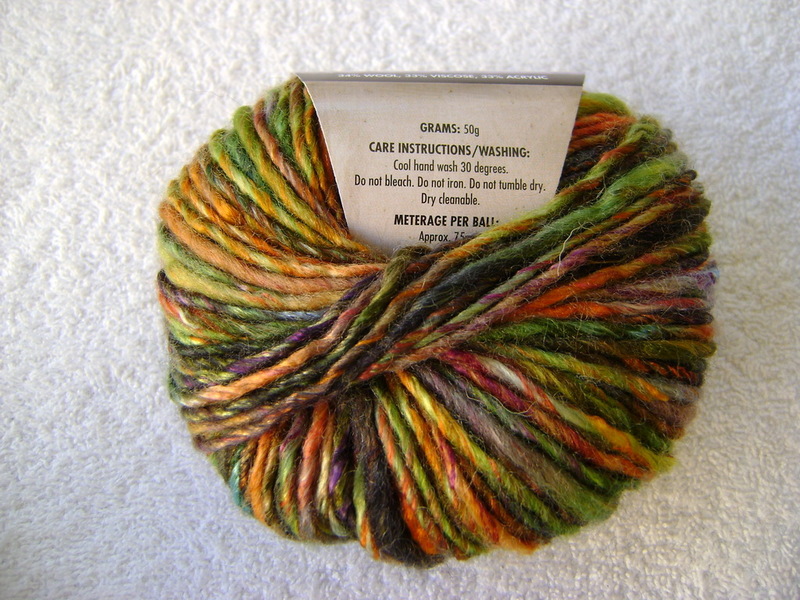 William…Handpainted merino 21.5mic roving in many shades of brown, very earthy. Aren’t they all stunningly beautiful? And a very affordable $11 each!! Can’t wait to start spinning with them. I’m off to meet with the Redland Spinners and Weavers at their Knit and Knatter at The Artist Tree tomorrow afternoon followed by a visit to the Twilight Makers Market in Cleveland. 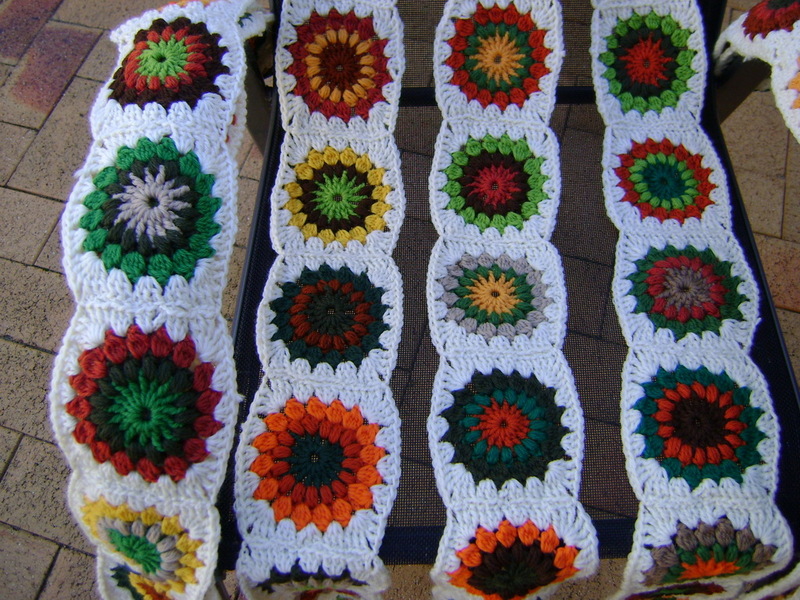 I have quite a bit of commercial yarn at home as well as quite a bit of hand painted/dyed yarn that I have sourced from some really quality suppliers here in Australia. 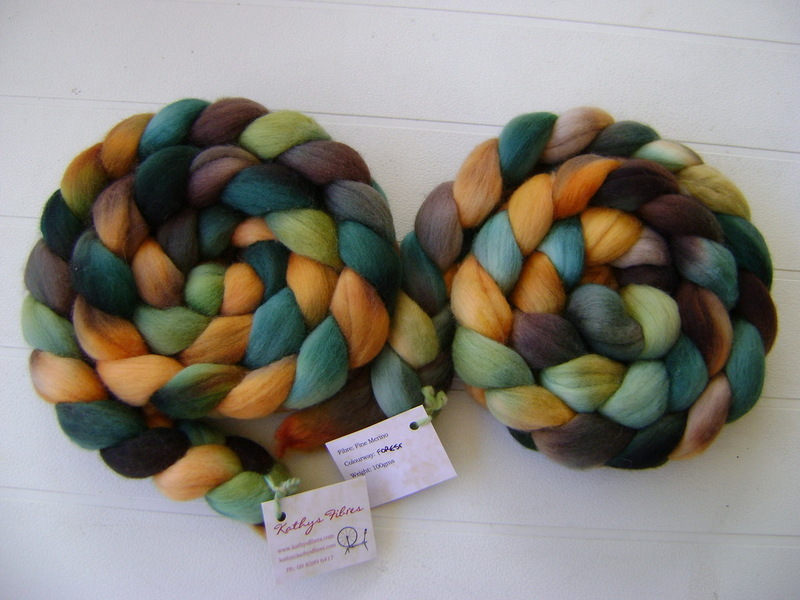 I have blogged about them before but if you’re new to my blog, my favourite Aussie hand painted/dyed yarn suppliers are Dyed By Hand Yarns, Augustbird, Skein and Shorn Fibers. 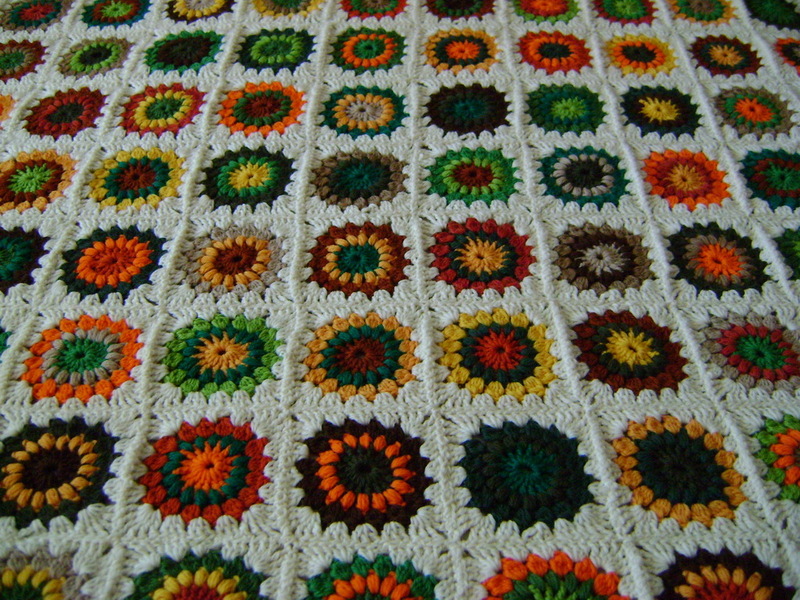 All these artisans produce beautiful yarns that are to ‘dye’ for! 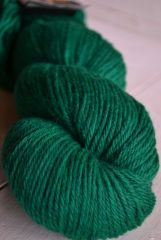 When it comes to yarn what counts as the main thing for me is the colourway….if the colour jumps out at me I will generally buy it regardless of the cost (unfortunately for my bank account!!). 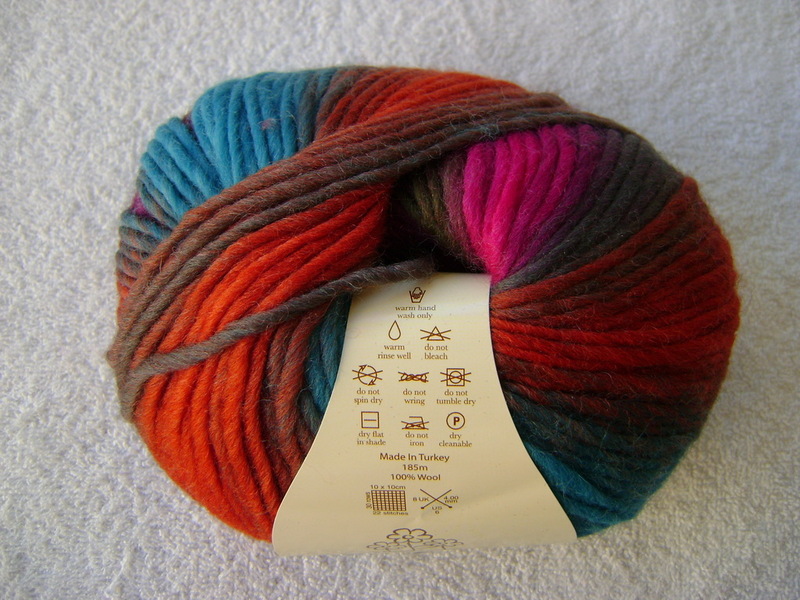 In most cases I buy yarn before I know what I am going to knit or crochet because I am so taken with the colours. Hence my burgeoning stash! So I have been carried away this month and used this voucher twice! They reprinted another voucher in yesterday’s paper so of course, I had to slip down to Spotlight today to use it. And don’t discount the fact that I won’t be visiting Spotlight before next Sunday as that’s when the sale finishes as I have another spare voucher!! 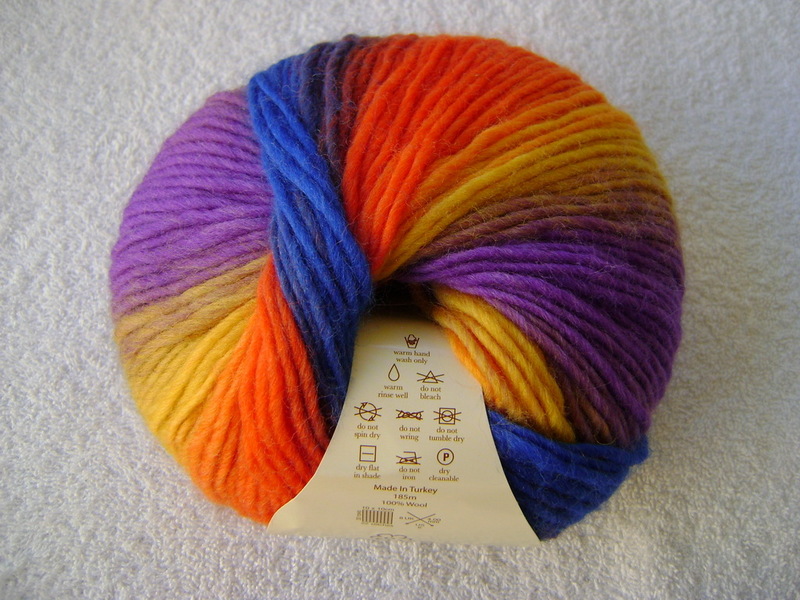 When I first saw this yarn on the shelf I almost fell over as I was just floored by the beautiful vibrant colours. 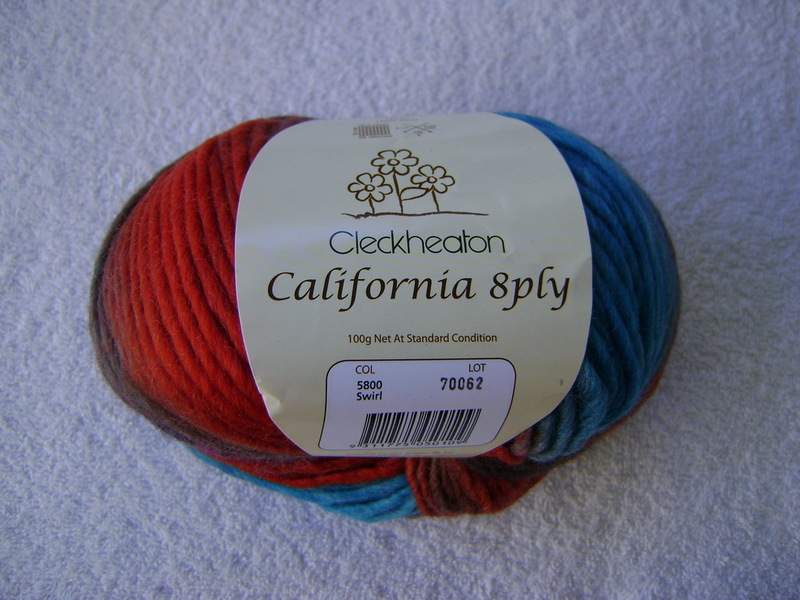 It’s Cleckheaton California 8ply and the colourway is quite appropriate – Mackaw (and that’s how it’s spelt on the label). Isn’t it simply divine. I bought about six balls and I have no idea at this stage what I will make but I just couldn’t resist it! Simply stunning don’t you think? 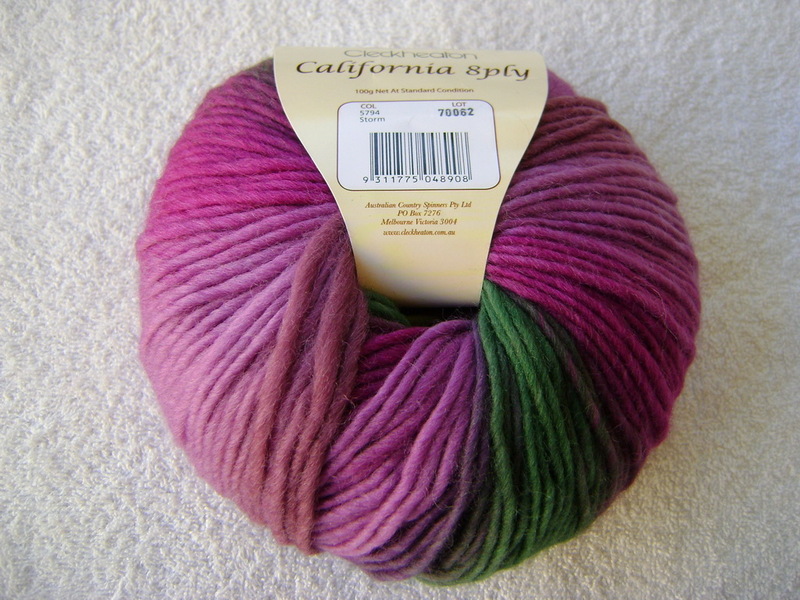 This yarn is also Cleckheaton California 8ply and the colourway is Storm. Again, gorgeous colours that I couldn’t resist! 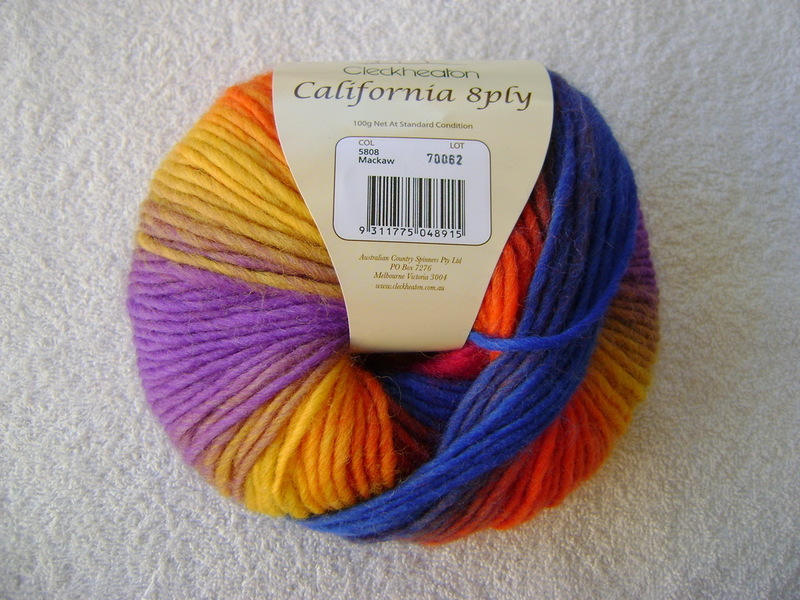 And this yarn is also Cleckheaton California 8ply and the colourway is Swirl. By the way, it retails for $9.99 but with all my discounts I managed to pick each ball up for just over $5. I love a bargain! Who’d have thought all these colours would look so good together!! 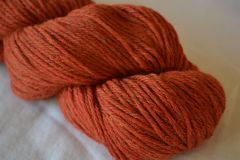 This yarn is just a solid colour although with my orange/tangerine phase I’m in at the moment, I was immediately attracted to it. 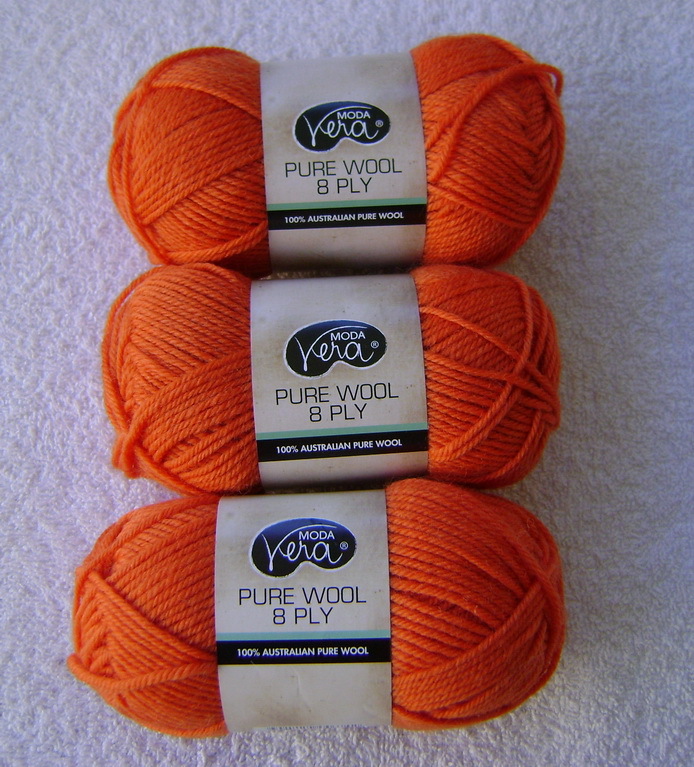 It’s called Moda Vera Pure Wool 8 ply – Tangerine. It retails for just over $3 and I’ve managed to pick up a stack of it for just over $1. Now generally I’m a wool girl however this colourway caught my eye. 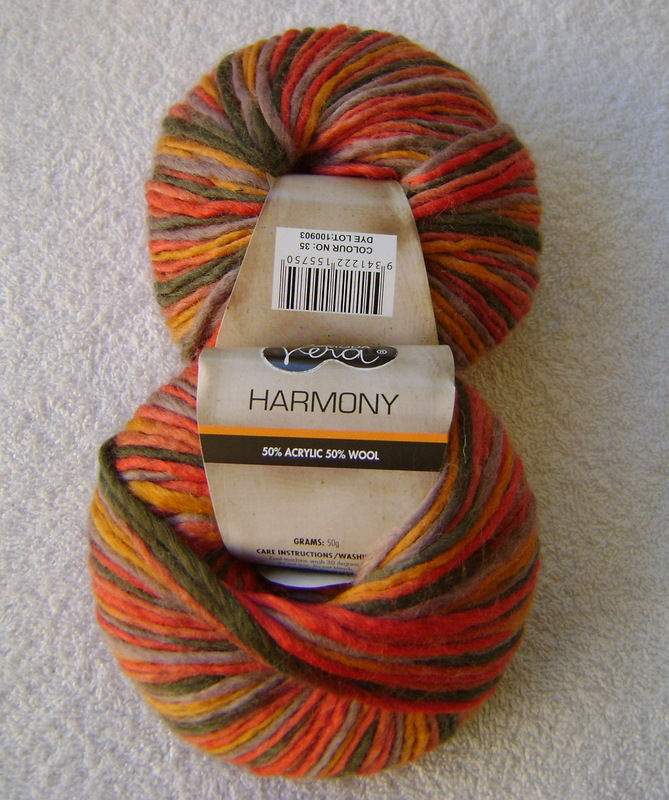 It’s Moda Vera Harmony and it’s a 50% wool / 50% acrylic mix so I am getting some wool! 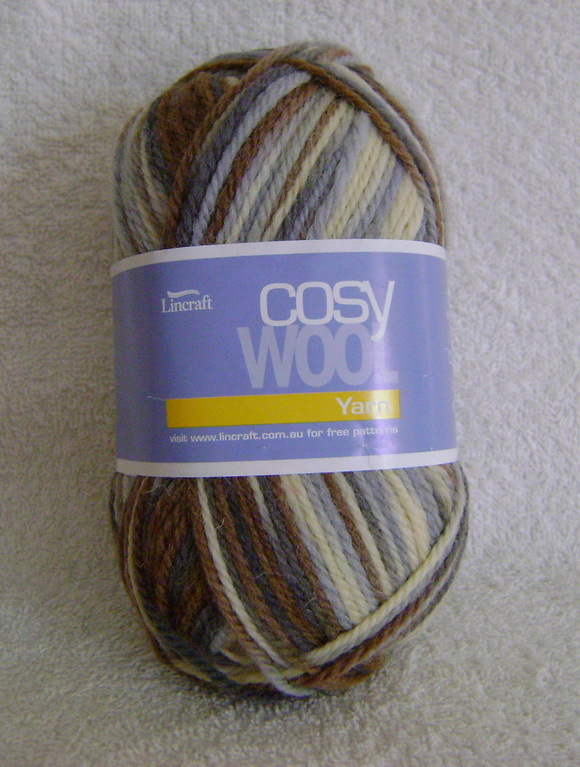 You know how much I love my autumn shades; well this yarn has those shades in copious amounts. 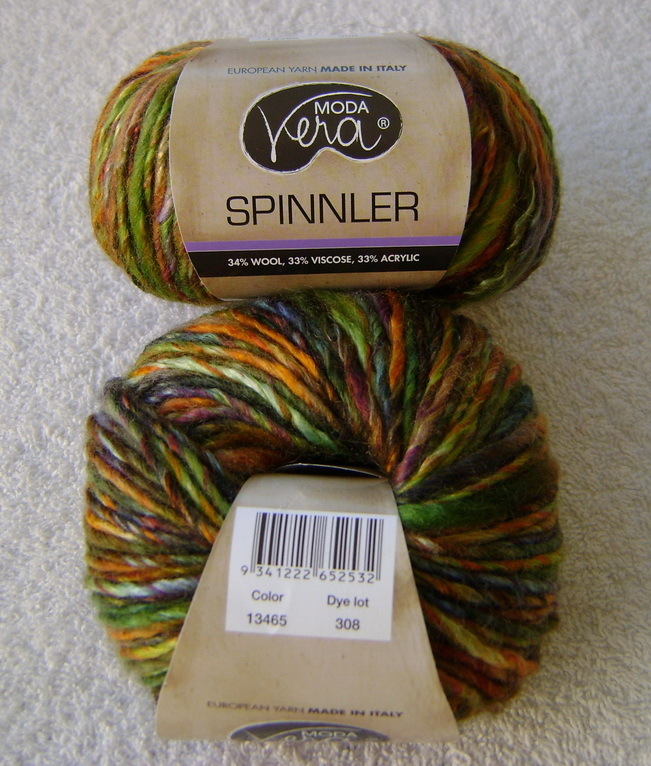 And finally…….I was totally blown away when I saw this Moda Vera Spinnler 34% wool / 33% viscose / 33% acrylic mix. It sneaks in by the skin of its teeth when it comes to wool content 🙂 Look at those colours, I mean how could I walk past it? 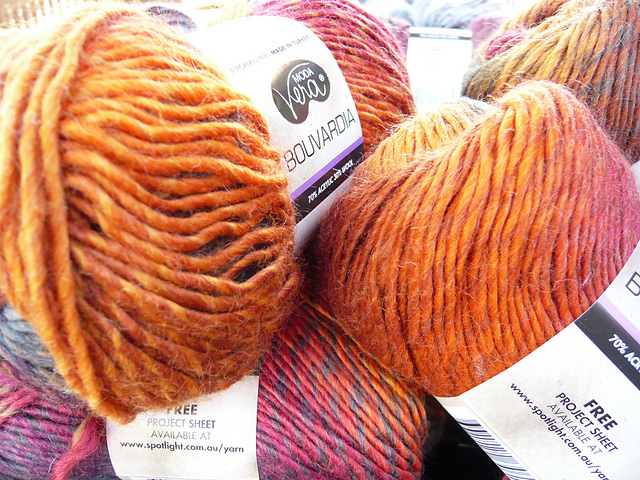 Talk about autumn shades; this yarn takes the cake! I picked up 15 balls for $3.70 each. I’m thinking of making a rustic type vest with it if I can find the right pattern. I’d love an adult sized vest based on the Milo child’s vest which is knitted in the round. 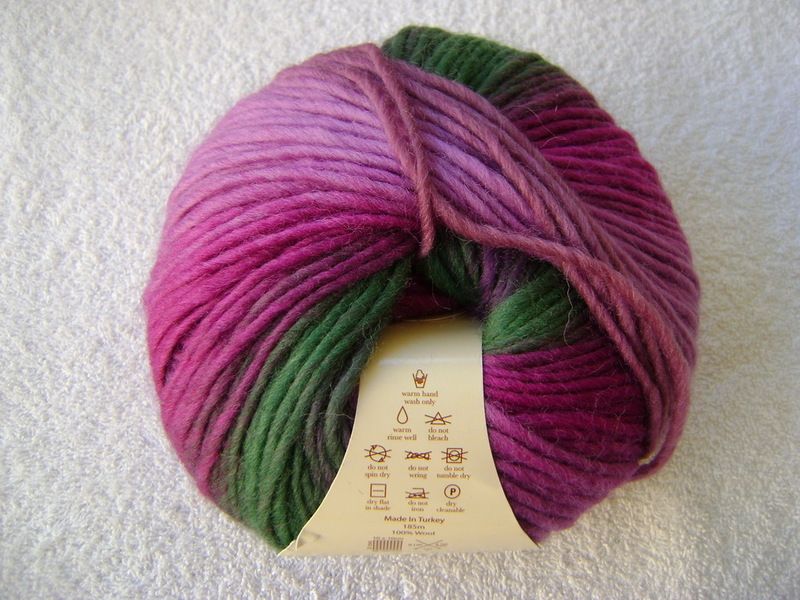 Has anyone got some suggestions for an easy adult’s vest that would show off this yarn? If not, I’m seriously thinking about adapating the Milo to an adult’s size. 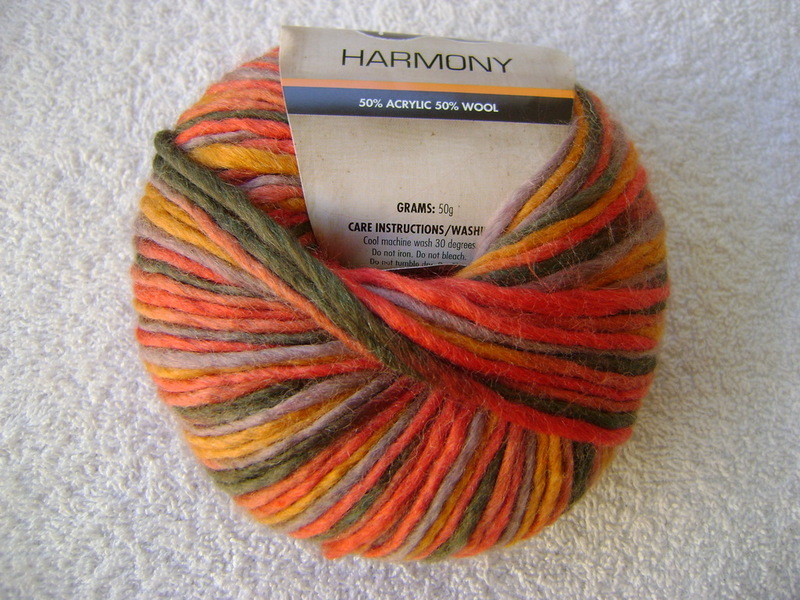 I practically cleaned out Spotlight’s supply of this yarn. I don’t think anyone dared to come near me to try to get some as I was a woman possessed as I filled up my basket with Spinnler! 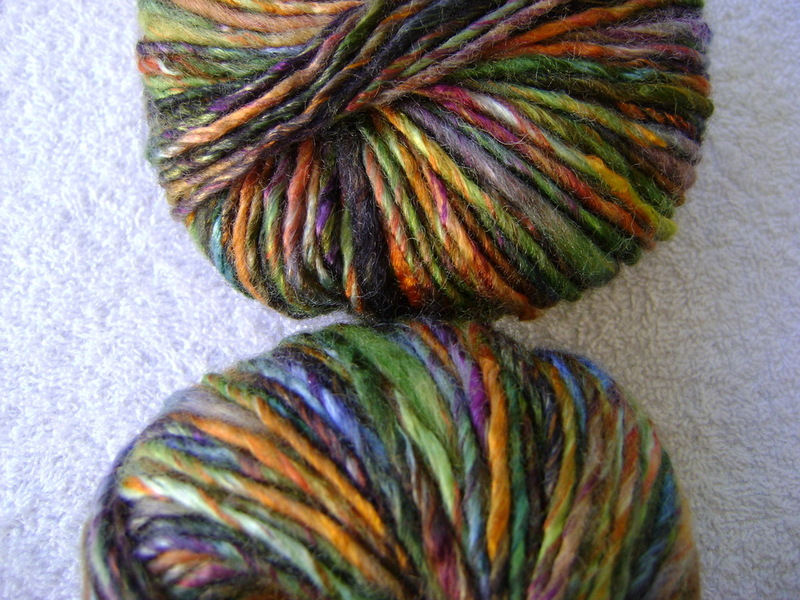 I couldn’t stop taking photos as I am so enamoured with this yarn. 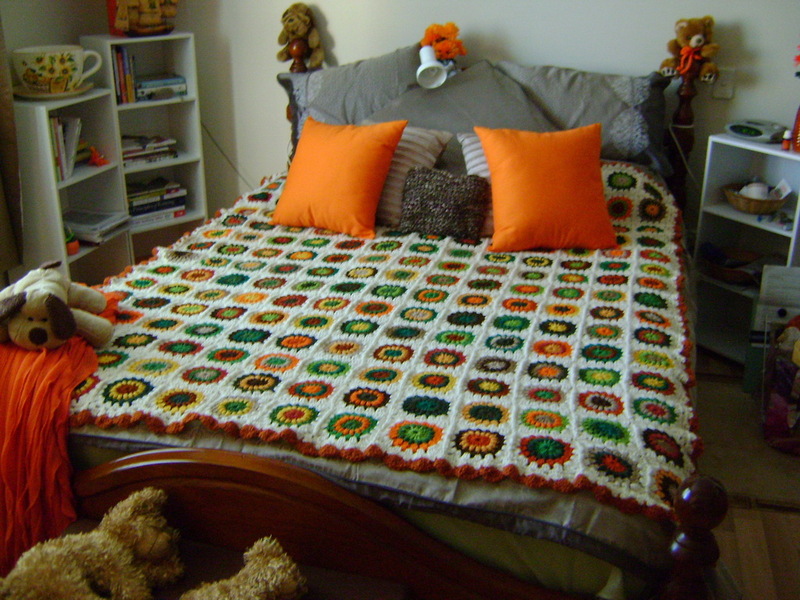 Spotlight also have lots of free patterns on their website so I might even find a pattern or two for some of my yarn. Well that’s how I spent part of my weekend. How about you? I hope you had lots of fun. Oh and by the way, my feet were toasty warm this weekend as I’ve started wearing my lovely hand knitted socks. They feel divine and I have sooo many to pick from too. I finished making these socks a while ago but have had to hold off posting them on my blog as they’re a present for one of my friends who follows my blog and I didn’t want to spoil the surprise. Her birthday was last week so I can finally share them with everyone. The pattern comes from the Yarn Harlot’s book “Knitting Rules” – Sock Recipe: A Good, Plain Sock by Stephanie Pearl-McPhee and is an ideal pattern to use with self patterning sock yarn. 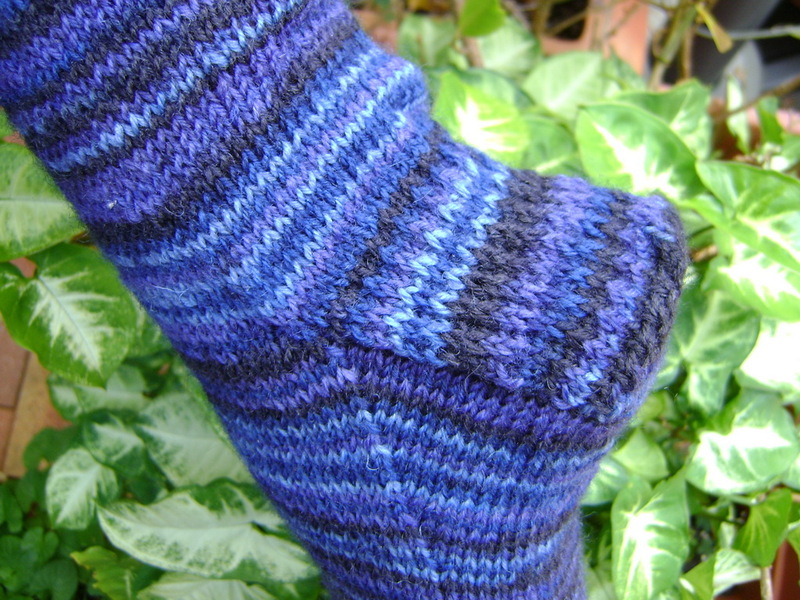 Nearly 10,000 pairs of socks have been made using this pattern and recorded on Ravelry!!!! 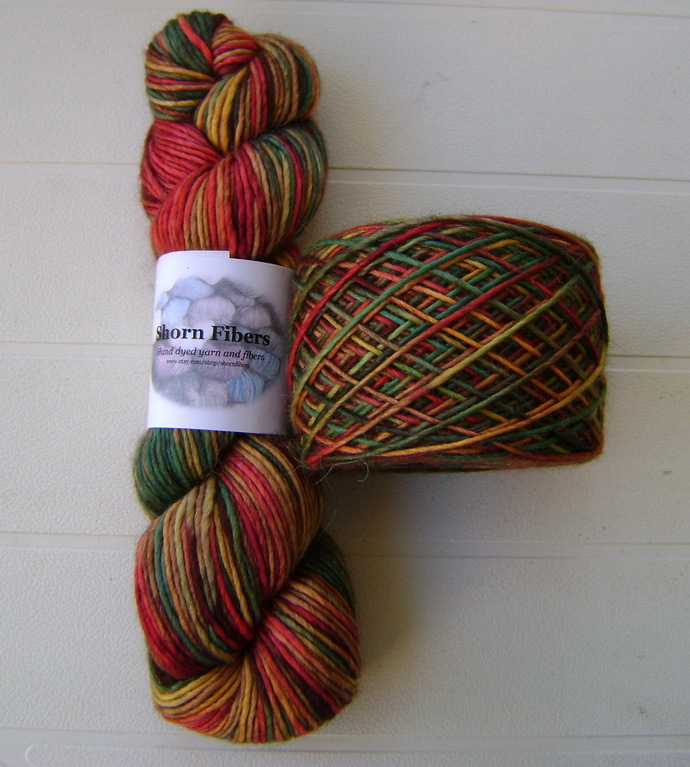 The sock yarn I used for these socks is one of my favourites….the very reasonably priced Moda Vera Noir sock yarn. 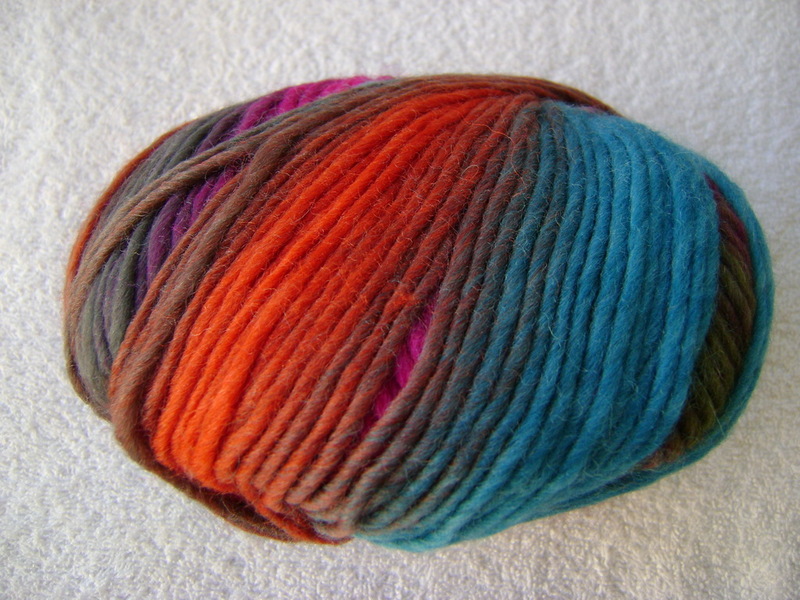 This particular colourway is 02 Blue Mix. 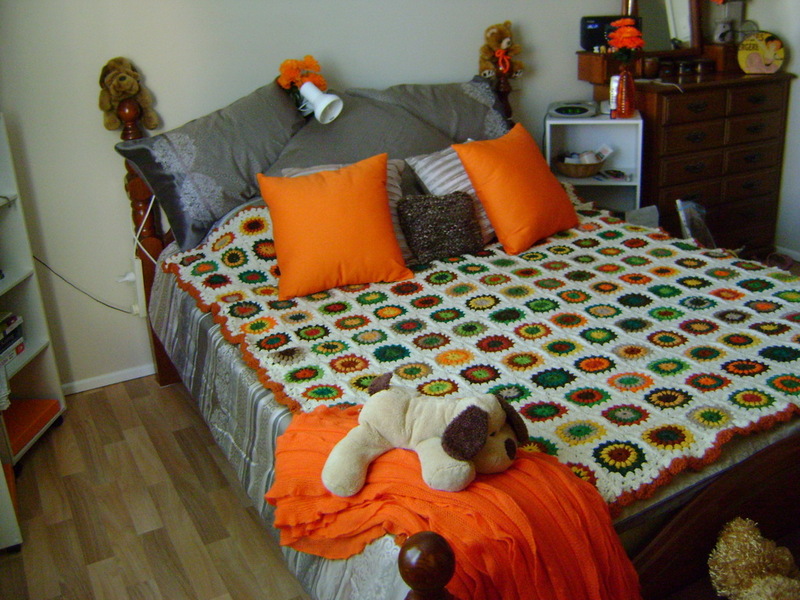 I love all the different colours and patterns. 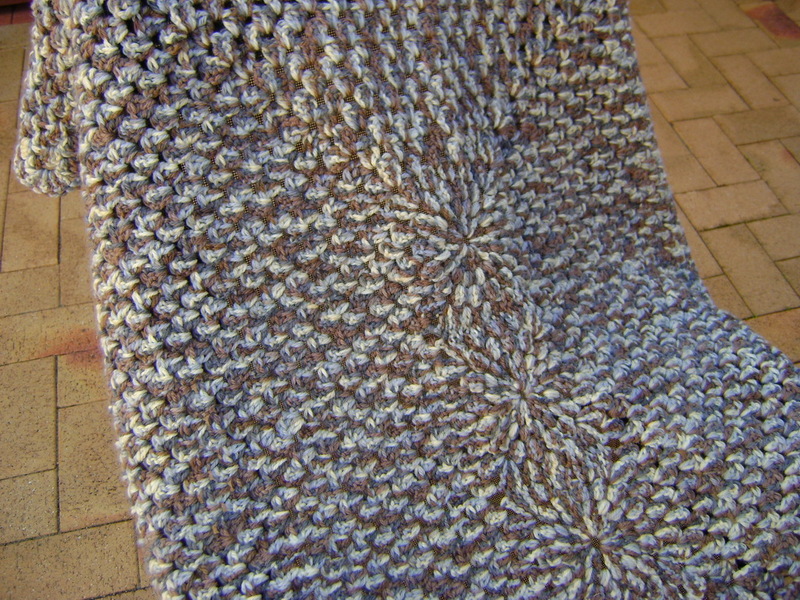 It’s always exciting knitting with this type of yarn as you never know what kind of patterning will emerge. 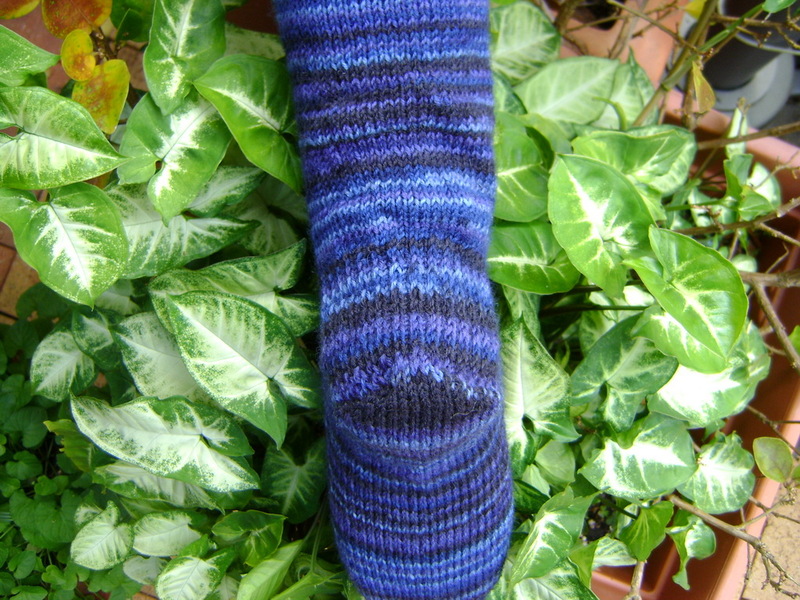 I made a couple of variations when knitting these socks….I used 5 dpns rather than 4 dpns and I also picked up 18 sts on either side of the heel flap. I knitted 32 rows in total for each heel flap. I also grafted 20 sts at the toe (10 sts on each needle) so the toe has more of a squarish rather than pointy finish. And Helen, I forgot to menion something very important….a gentle hand wash in wool mix in a small bowl of tepid water, rinse and lay out in the sun to dry. The more you look after your homemade socks, the longer they will last. I’ve been quite good today by knitting some more of a UFO…..a vest for me that I started in July last year!!! I’ve nearly finished the back and then I’ll need to do the front. 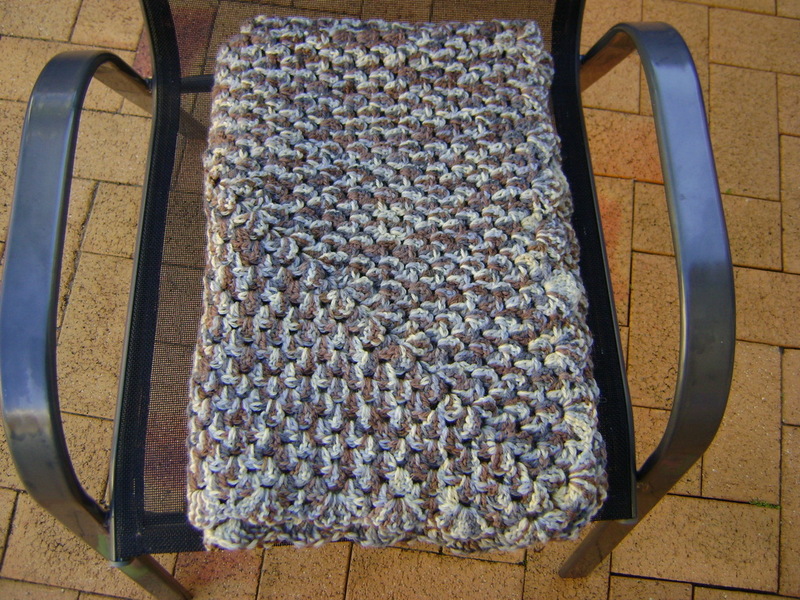 The pattern is mock cable….one of my favourites. 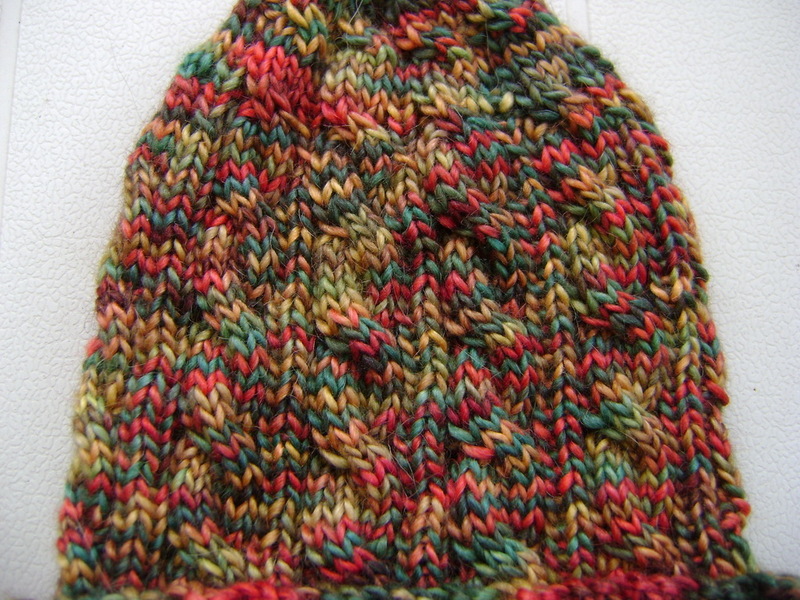 Lately I just seem to gravitate towards quick, easy knits like socks and baby hats. 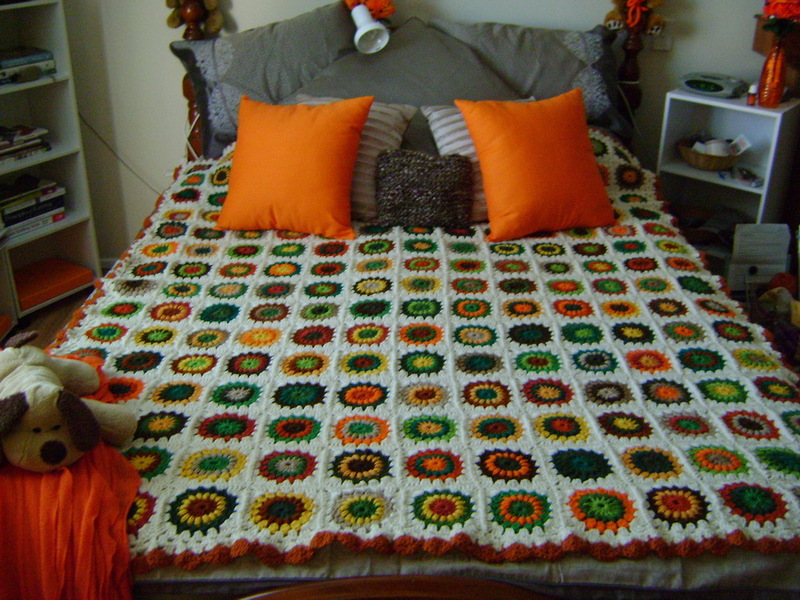 At least I finished my Starburst Flower Crochet Blanket which took well over a year to complete!! 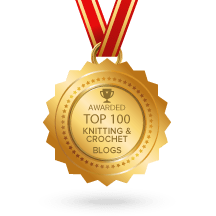 I still have another two UFOs….my Falling Water Scarf and Elinya Shawl. I am really trying to get them finished as soon as possible as this is the weather to be wearing them.